Of the composers of the Baroque Period (1600-1750) in music, Vivaldi is most remembered for his concertos ‑ he wrote over 500! Most of his concertos were for the violin (more than 230) but he also wrote concertos for other instruments, such as: viola (6), cello (27), mandolin (2), trumpet, oboe (17), bassoon (37) and, of course, the flute (16 - including 3 for Piccolo and 2 for Recorder). Vivaldi only assigned Opus Numbers to his published works. In 1733, after Opus 12, he stated that he wasn’t going to publish any further because it interfered with the sale of his manuscripts (from which he received more money). The Il Pastor Fido, Op. 13 (The Faithful Shepherd) Flute Sonatas are considered spurious, constructed from parts of works by Vivaldi, in addition to Joseph Meck (1690-1758) and Giuseppe M. Alberti (1685-1751). The Alberti Bass pattern, used by Vivaldi and other Baroque and Classical composers is named for Domenico Alberti (1710-1740, no relation to Giuseppe), who was the first composer to employ it. 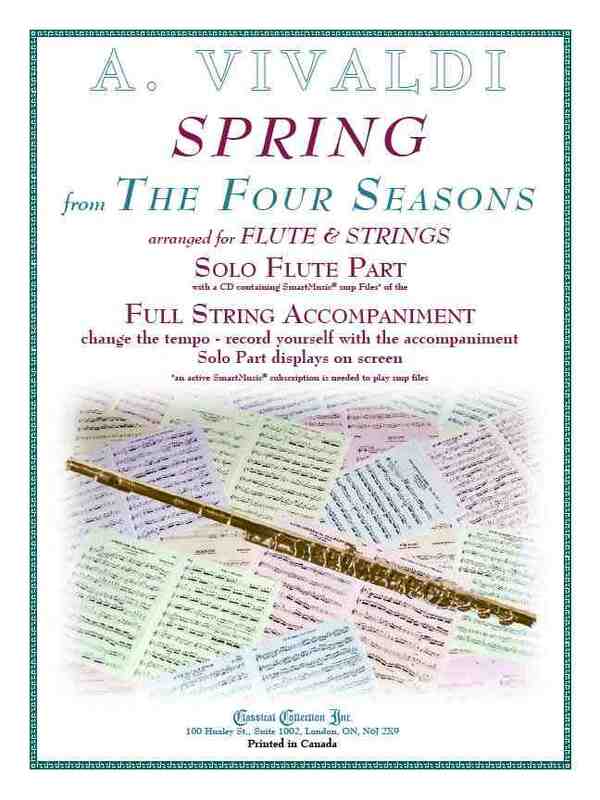 The Four Seasons are the first 4 Violin Concertos (of 12) in Vivaldi’s Opus 8, published in 1725 under the title Il Cimento dell’ Armonia e dell’ Invenzione (The Contest of Harmony and Invention); Spring is the first, and probably most recognizable and famous of The Four Seasons. the shepherd sleeps with his faithful dog (viola) at his side. nymphs and shepherds dance under the glorious spring sky. The most difficult part in Spring is the section containing sixteenth note triplets in the solo part in the 1st movement (47-55). The “X” versions of the smp files change these to simply sixteenth notes - as printed on page 6; the only difference between pages 5 and 6 are bars 47 to 55. If you want to play this version, turn to page 6 during the rest (bars 45-46).